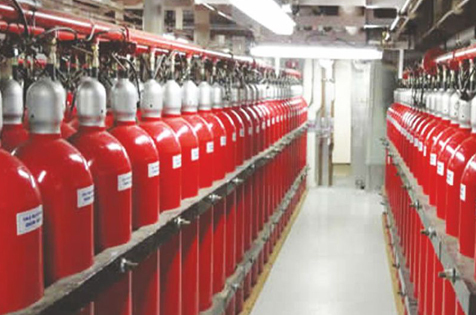 How did Halon become so prominent for fire protection? Fire losses have always occurred. With advances in technology and mechanization the opportunity for catastrophic casualties also increased, especially when involving large quantities of liquid fuels. Around 1948, the US Army, sustaining tremendous losses in World War II, initiated a research review with Purdue University searching for a very efficient, less toxic, fire extinguishants. The study, which became public later, considered approximately 60 compounds. These were mainly halogenated hydrocarbons (thereafter labeled as numbered halons). Halons 1301, 1211, 2402 and 1202 were identified (as were CF3I and PBr3, but both were considered likely to be more toxic). The US developed primarily halon 1301. Europe used halon 1211 but later increasingly used halon 1301 due to greater halon 1211 toxicity. Russia (and the former Soviet Union countries) employed primarily halon 2402. Here, ease of manufacture was probably a consideration. If you are not part of the solution, you are part of the problem.” That dictum is too simplistic and harsh to apply generally. Success involves having the players have a stake in the desired outcome. Companies that manufacture halons can perhaps be involved in manufacturing replacements. Their issue is not resisting phase-out, but replacing an existing product with a new product and achieving market share. The more narrow methyl bromide sector, however, did not have an in-kind replacement product. Possible solutions were emerging from completely different industries. Therefore resistance to regulation was strong. Fire protection companies could perhaps adapt to new approaches, but there is the definite possibility of undesirable change and uncertainty. There were grave concerns in the fire protection community about the dislocations the lack of halon would cause, as well as doubts that such action was really warranted. I received many calls along the lines, “How can they take away my halon?” “Don’t they know lives and assets depend on it?” “The powers that be must give my use an exemption for continued production and availability.” As I stated, as a talking head, in a CNN Science Watch interview, many if not most halon usage was not absolutely necessary. Alternatives did exist. But there was some fraction of halon use for which there were not acceptable replacements that were currently technically and economically feasible. M-Fire Suppression Inc. is now actively involved with the DOD to prove we have the best Halon replacement on the planet with the best NOEL rating and our replacement would be easy without having to change the size of the pipes and tank storage locker rooms. We are addressing this problem like we are when it relates to being the safest and most cost-effective way to defend high density wood framed building from arson attacks, including the even bigger recent concern, which is the loss in homes during wild fires. We are part of all the USA fire suppressant problems with the cleanest first chemistry the industry as ever seen, recognized by UnderWriter Labs GreenGuard Gold Certification which no competitors can claim.